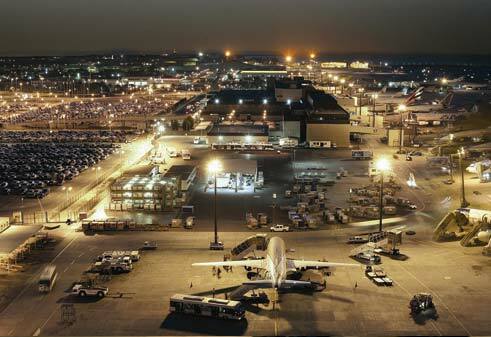 Bahrain International Airport (IATA: BAH, ICAO: OBBI) (Arabic: مطار البحرين الدولي‎) is an international airport located in Muharraq, an island on the northern tip of Bahrain, about 7 km (4 miles) northeastern the centre of the capital Manama. It is the primary hub for Gulf Air and Bahrain Air. Significant portion of passengers served by the airport are Saudis and Western expats working in the eastern province of Saudi Arabia, designated bus and limousine services move passengers from Khobar and other Saudi cities to Bahrain Airport, this is due to the convenience provided by King Fahd Causeway as well as the low prices that makes it more preferred than Dammam Airport. The airport has a three star rating from Skytrax's airport grading exercise along with seven other airports.. In 2010, Bahrain Airport has been named as the winner of the Best Airport in the Middle East award at the Skytrax 2010 World Airport Awards. During World War II, the airport was used by the United States Army Air Force Air Transport Command Central African Wing, being designated as Station # 13. It functioned as a stopover en-route to Abadan Airport, Iran or Sharjah Airport, UAE on the Karachi-Cairo route. From the end of World War II until Bahrain's independence in December 1971, the Royal Air Force maintained a military installation at the airfield known as RAF Muharraq. The majority of these facilities were later acquired by the Bahraini flag carrier airline, Gulf Air, while a small portion continues to be utilized by the U.S. Navy as Aviation Support Unit (ASU) Bahrain. In 1936, the operation of H.P.42 aircraft from London to India via Bahrain had been stepped up to a twice-weekly frequency. In 1937, Bahrain saw the regular service of the Empire sea planes. The landing strip of these giants on the water was from where the marina club is located in Mina Salman today. From the 1950s, BOAC operated several services a week through Bahrain. These included weekly services to Karachi, Singapore, Hong Kong and three times a week to Sydney. 1950 was a significant year not only for Muharraq as an international airport, but also for Bahrain's own commercial aviation history. In this year, a new local airline, Gulf Aviation Company, was formed - the forerunner of Gulf Air. The company started with only one aircraft, a second-hand Anson Mark II, which was used initially on services to Dhahran. But within two years, the fleet had expanded to four de Havilland aircraft and DC-3s for use on a steadily growing network in the Persian Gulf. This established Bahrain as an international stage. It was easily the most modern and advanced airport in the Persian Gulf with a good runway, control tower, lighting, communication facilities and even restaurants. It began to attract other carriers such as Middle East Airlines, Air India, Air Ceylon and Iran Air - mostly operating Dakotas. In December 1961, a new passenger terminal opened at the airport. During 1970–1971, RAF Muharraq is scaled back and eventually closed. In December 1971, the airport opened new passenger facilities, which included a wide area that could accommodate four 747 aircraft. In 1976, the airport marked another significant first with the inauguration of supersonic flights, which saw the start up of regular BA Concorde service between London and Bahrain. In the 1980s and 1990s, major facelifts took place and all the major airline companies made the airport a destination. In 1994, a US$ 100 million terminal was inaugurated. It was announced on October 8, 2009 that BHD 1.8 billion expansion of Bahrain International Airport is going to start in 2010. The expansion, planned over the next 30 years, will triple the passenger capacity to 27 million a year. Two new terminals will be opened in the next four years as part of the expansion. Terminal Two will be commissioned by 2012 and Terminal 1A will become operational a year later. The expansion will include all modern facilities, including leisure areas, shopping centres, hotels and anything else that a modern traveller needs, will be incorporated in the new development. The expansion will also include a swimming pool. The present terminal building (Terminal 1) will be demolished in 2014 and replaced with a brand new state-of-the-art structure within a few years. Construction of Terminal 2 will begin early in 2010. There wil be 110 aircraft stands including 87 with contact gates and 23 without. This also includes 17 new remote aircraft parking bays, installation of automatic baggage screening facilities, improved ground handling and overall new passenger handling standards. The cargo handling capacity will also increase from the present 350,000 cubic meters to 1.5 million cubic meters. All ground handling facilities at the airport were being enhanced in collaboration with the company that manages Munich Airport in Germany. A new VIP terminal and an Airport Centre that will includes shops, entertainment facilities and car parking will be developed as part of the project.